This movie camera was produced in 1947. It was equipped with a lens Baush + Lomb Animar 1:2,8/12,7mm. Its weight is kg. 1,100 and its measures are the following: 58x100x132 mm. This movie camera was produced in 1940. When it was introduced on the market, Samuel Briskin wanted to sell a product that was similar like the "Bell&Howell Companion", yet sold for just about half the price. It is equipped with a lens Wollensak Revere 12,5 mm, f:3.5, Velostigmat. The housing is made by metal and its color is brown. Its weight is kg. 0,900 e its size is 58x127x110 mm. This movie camera was produced in 1962. It was equipped with a lens Wollensac f:1.8 9-30mm Raptar Zoom. 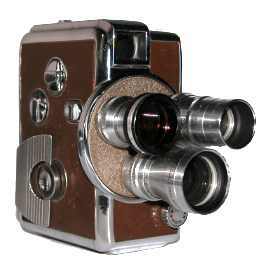 Movie camera produced in 1952. It is equipped with a lens Wollensak Cine Raptar 1:2,5, 13mm. It works perfectly. Its body is in grey metal, with brown inserts. Ii weights 0,850 kgr. and its measures are the following: 55/118/100mm. 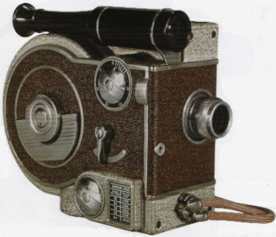 Movie camera produced in 1952. It is equipped with a turret with three lenses: Wollensak Cine Raptar 1:2,5 13mm, Wollensak Raptar 1:3,5 38mm, Elgeet 1:1,9 7mm. It works perfectly. Its body is in grey metal, with brown inserts. Ii weights 1,100 kg. and its measures are the following: 52/120/140mm. 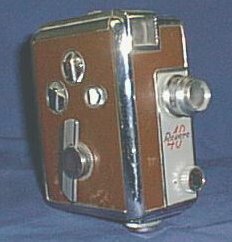 This movie camera was produced in 1962, it was very similar to the Revere Zoom series 116/119, and it was equipped with the same lens. In fact, inside the case, it is written "Wollensak by Revere"
It is equipped with a Wollensac f:1.8 9-30mm Raptar Zoom Lens.